Dance History is filled with some of the most inspiring stories of African American / Black dancers and choreographers. 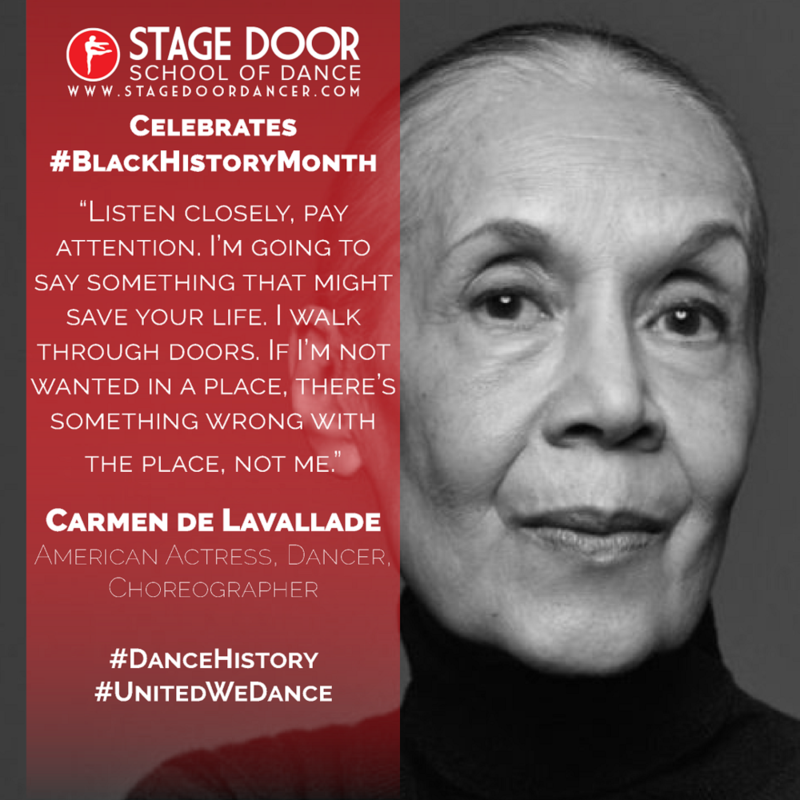 In celebration of #BlackHIstoryMonth, Stage Door will be dedicating all of our #DanceHistory learning moments to several of these inspirational artists that we feel our dancers must learn about to understand the shoulders in which they are standing upon now as young dancers in training. Come back each week for the month of February to learn more about these incredible dancers! 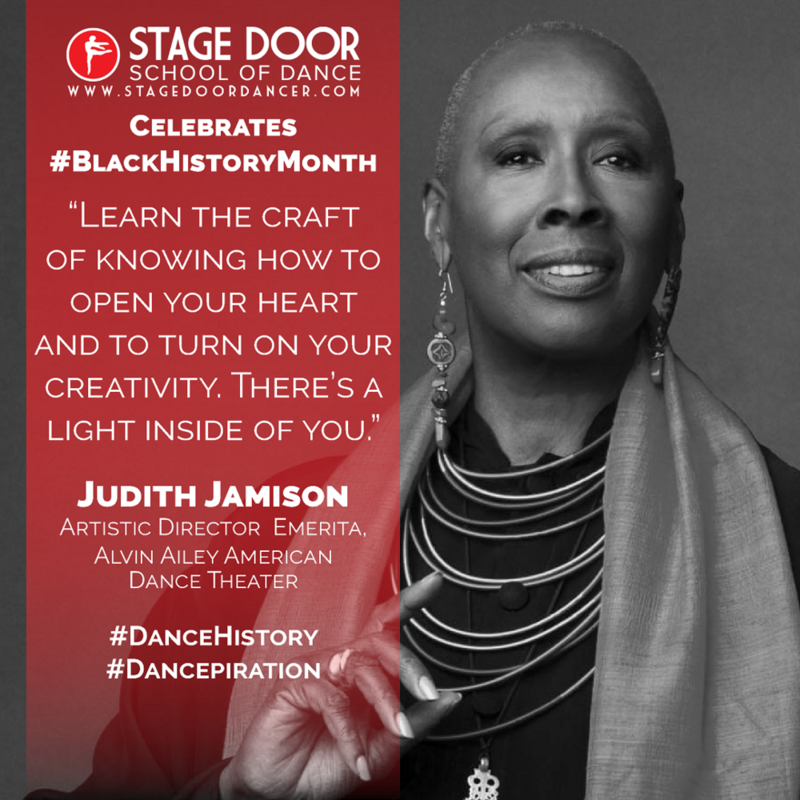 Learn more about the inspiring dancer / choreographer and Artistic Director Emerita of Alvin Ailey American Dance Theater, Judith Jamison here. In 1954, dancer, actress, and choreographer Carmen de Lavallade made her Broadway debut partnered with Alvin Ailey in Truman Capote's musical 'House of Flowers' starring Pearl Bailey. Learn more about Ms. de Lavallade by visiting: here and here. Frankie Manning was an American dancer, instructor, and choreographer. Manning is considered one of the founders of Lindy Hop. Learn more about Frankie Manning by visiting here and here. Pearl Primus was an American dancer, choreographer, anthropologist, Broadway veteran, and teacher whose performance work drew on the African American experience and on her research in Africa and the Caribbean. Learn more about about Ms. Primus by visiting here and here.